The Houses of Parliament is also known as the Palace of Westminster and is the meeting place of the two houses of the Parliament of the United Kingdom – the House of Commons and the House of Lords – where members of Parliament and the Lords propose and debate new legislation. After a fire in 1834 most of the existing building was demolished and rebuilt to a 1835 design by Charles Barry which was described by an architectural magazine of the day as “a quadrangular pile, with the principal front facing the Thames, and a tower in the middle”. Because of this orientation, the best view is from the far side of Westminster Bridge on the opposite bank of the river. The Palace of Westminster has been a part of a UNESCO World Heritage Site since 1987. The building is 3 storeys high and rectangular with the principal facade having a length of 266 metres. There are more than 1,100 rooms, 100 staircases and nearly three miles of corridor arranged around two series of courtyards. The building is orientated lengthways along the river which flows from south to north at this point. The style is Perpendicular Gothic and there any many towers and turrets arranged above the ornate facade. The three main towers are: The 98.5 metre Victoria Tower which is in the south west corner of the palace over the Sovereign’s Entrance, The 96 metre Clock Tower (commonly known as Big Ben) at the north end and the 91 metre octagonal Central Tower which stands over the middle of the building immediately over the entrance lobby. Visitors should use St Stephen’s Entrance in the middle of the building’s western front. Guided tours take visitors into both the Commons and Lords chambers and the historic Westminster Hall, it is best to book in advance. Visitors can attend debates in both Houses and watch committee hearings. The guided tour takes about 75 minutes and includes the Commons and Lords Chambers, the Queen’s Robing Room, the Royal Gallery and Westminster Hall. Tours are available on Saturdays and during summer 2012 from 27th July to 1st September Monday to Saturday. Times are normally 9.15am – 4.30pm, but on Wednesday 15th, 22nd and 29th August, tours will be running from 1.15pm – 4.30pm. Prices: Adult: £15, Child (5-15 years) £6, Child (under 5): Free admission. St Edward the Confessor built a royal palace on what was then an island site at about the same time that he built Westminster Abbey (1045-50), and the island and surrounding area soon became known as Westminster. The Palace of Westminster was the monarch’s main residence until fire destroyed most of it in 1512. After that it served as the home of Parliament and almost all subsequent Parliaments have met there. In 1834 fire destroyed almost every part of the rebuilt Houses of Parliament leaving only Westminster Hall, the detached Jewel Tower and the Undercroft Chapel, Cloisters and Chapter House of St Stephen’s standing. Immediately after the fire, King William IV offered Buckingham Palace to Parliament hoping to dispose of a building that he disliked, but his offer was declined. In 1836 Charles Barry’s proposal for rebuilding the Palace was chosen out of 97 entries. The New Palace was to be much larger than its predecessor and the design incorporated the remains of the Old Palace (with the exception of the Jewel Tower). The design involved reclamation of a significant amount of land from the Thames to enable the building of the principal facade. Construction started in 1840 and was completed in the late 1850s. In the Second World War the Palace of Westminster was hit by bombs on 14 occasions. One night in 1941 incendiary bombs set alight the chamber of the House of Commons and the roof of Westminster Hall. Fire fighters managed to save Westminster Hall but the chamber was destroyed. The Commons Chamber was rebuilt after the war under architect Sir Giles Gilbert Scott and was completed in 1950. 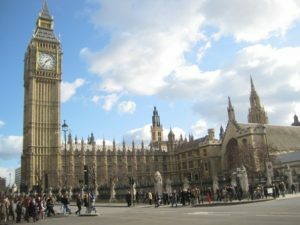 The largest tower of the Palace of Westminster is the Victoria Tower which occupies the south west corner of the building. It stands 98.5 metres above the Sovereign’s Entrance which is used by the monarch when entering the building for the State Opening of Parliament and other formal occasions. On the roof of the tower is a 22 metre flagstaff from which flies the Royal Standard (the monarch’s personal flag) when the Sovereign is present in the Palace. On the days when either House of Parliament is sitting the Union Flag flies from the mast. Victoria Tower was called the king’s tower until it was renamed Victoria Tower in Victoria’s diamond jubilee year. Slightly shorter than the Victoria Tower is the Clock Tower which stands at the northern end of the building and has a height of 96 metres,. It houses the Great Clock of Westminster which strikes the hour to within a second of the time. The time is shown on four dials which are lit from behind at night. The dials are 7 metres in diameter, the hour hand is 2.7 metres long and the minute hand 4.3 metres long. The Clock Tower is commonly (but incorrectly) called Big Ben after the large bell which strikes the hour, this bell in turn is only nicknamed Big Ben – its official name is The Great Bell of Westminster. The bell has developed a crack which contributes to its distinctive sound. In the top of the Clock Tower is the Aytron Light which is lit when either House of Parliament is sitting after dark. It was installed at the request of Queen Victoria so that she could see from Buckingham Palace whether the members were “at work”. The tower has recently been renamed the Elizabeth Tower to reflect Queen Elizabeth’s diamond jubilee. The shortest of the Palace’s three principal towers is the octagonal Central Tower which is 91 metres high and stands over the the middle of the building above the Central Lobby. It was designed as a great central chimney to draw air out of the building. The Jewel Tower is located opposite Parliament and is one of the two surviving sections of the medieval Palace of Westminster. The Tower was built by Edward III between 1365 and 1366 on land appropriated from Westminster Abbey and was located on the edge of the private gardens at the south west corner of the Palace. The three-storey building was intended to serve as a storeroom for the king’s private collection of jewels, gold and silver. Nowadays the Crown Jewels are on display at the Tower of London. The Jewel Tower is managed by English Heritage and contains exhibitions relating to the history of Parliament and the history of the Jewel Tower. The monarch enters the building using the Sovereign’s Entrance beneath a 15 metre high decorated archway at the base of the Victoria Tower. This leads to the starting point of the royal procession route which is a suite of ceremonial rooms used by the monarch at the State Opening of Parliament. Members of the House of Lords use the Peers’ Entrance in the southern section of the west façade of the building. The entrance is covered with a stone carriage porch and opens to an entrance hall with a staircase beyond which leads up towards the chamber. Members of Parliament enter the building through the Members’ Entrance in the northern part of the west façade. Members of the public enter the building through the St Stephen’s Entrance in the middle of the building’s western front. Visitors walk through a series of hallways and flights of stairs which bring them to the octagonal Central Lobby which is the hub of the Palace. The hall is flanked by corridors which lead to ante-rooms and debating chambers. To the north is the Members’ Lobby and Commons Chamber, and to the south is the Peers’ Lobby and Peers’ Chamber. Westminster Hall is the oldest surviving building on the site. The hammerbeam roof dates from 1399 and has been described as “the greatest creation of medieval timber architecture”. The Hall itself is much older having been completed in 1099. The roof allowed what had originally been three aisles to be replaced with a single huge internal space. The hall has been used for a range of purposes including important trials such as those of Sir Thomas Moore (1535), Guy Fawkes (1606) and King Charles I (1649). The debating chambers are so small that seating in the House of Commons can only accommodate 427 of the 650 elected Members of Parliament with the rest having to stand. The layout of the chambers reflects the fact that parliament formerly met in a chapel and the seating is arranged like choir stalls in parallel rows. The Peers’ Chamber is located in the southern part of the palace and measures 14 metres by 24 metres. The benches in the chamber as well as other furnishings in the Lords’ side of the Palace are coloured red. The upper part of the chamber is decorated with stained glass windows. The Commons Chamber is located in the northern part of the palace and measures 14 metres by 21 metres. The benches in this chamber and other furnishings on the Commons side of the Palace are coloured green. The Speaker’s Chair occupies the north end of the chamber. On the floor of the chamber are two red lines 2.5 metres apart and protocol dictates that members must not cross the lines when speaking. According to tradition, the lines are intended to be just over two swords lengths apart and intended to prevent arguments degenerating into duels. However members have never been allowed to bring swords into the Chamber and in the days that gentlemen carried swords there were no lines. Following a general election and before each new session of Parliament in the autumn the monarch travels to the Palace of Westminster from Buckingham Palace in the Irish State Coach for the State Opening of Parliament. The Imperial State Crown, which is worn by the monarch for the ceremony, as well as the Cap of Maintenance and the Sword of State which are carried by the monarch during the ceremony also travel to the Palace by carriage. The Queen, having entered the Palace by the Sovereign’s Entrance presides over the event from the House of Lords – no monarch has been admitted to the Commons since Charles I caused a civil war by forcing his way in and trying to arrest 5 MPs. He was subsequently executed for treason as an “implacable enemy to the Commonwealth of England”.